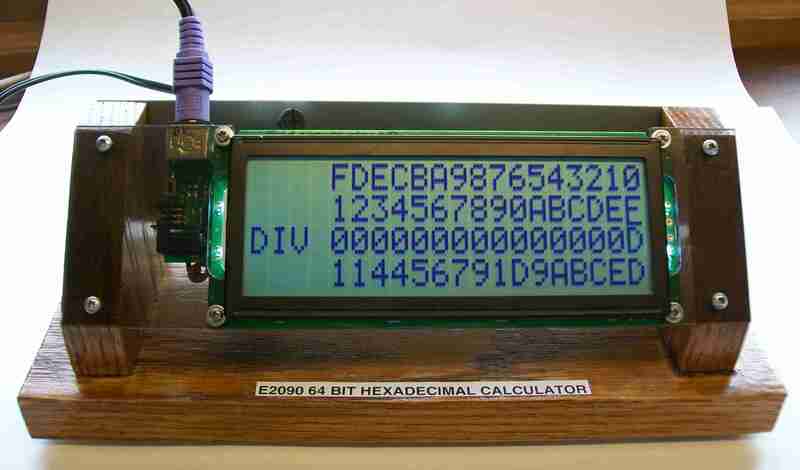 E2090 64 Bit Hexadecimal/20 Digit Calculator | Locus Engineering Inc. The E2090 64 Bit Hexadecimal Calculator has 64 bits or 20 decimal digits resolution and is ideal for evaluating large number equations and testing logical processes. Data entry is via a PS/2 keyboard and arrow keys allow either of two variables to be entered or edited while simultaneously updating the result on a large 4×20 LCD. Seven arithmetic functions, twelve single variable logical functions, and six dual variable logical functions operate on decimal or hexadecimal numbers. Both signed or unsigned operations are supported. Any of the two input operands or the two output words can be saved to one of eight memory registers, and recalled to any of the two input operands for efficient equation solving. A serial interface provides a record of the keystrokes.